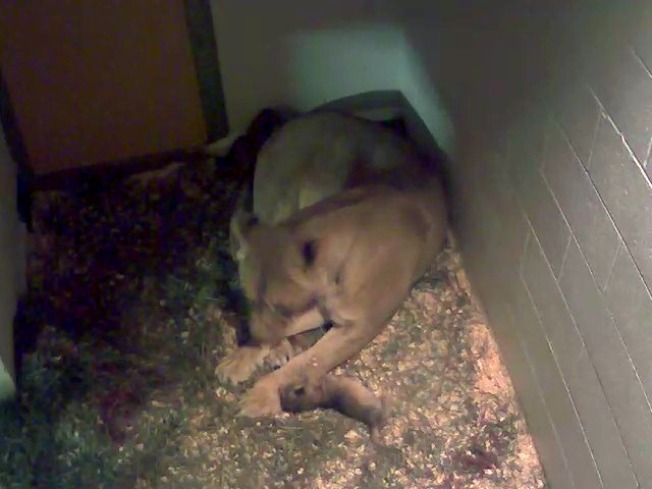 More cuteness has arrived at the National Zoo, where four lion cubs were born sometime between 10:30 last night and 2:30 a.m. today. They're the second litter this year. The cubs are mobile and appear to have nursed, say zoo officials. Their parents are first-time mom Shera, 5, and Luke, 4. "Although the Zoo has managed lions in the past, it has been many years since it had the right combination of animals by age and gender to develop a pride," said a zoo release. Shera, Luke and Nababiep -- Shera's sister -- were introduced almost two years ago, and Shera and Luke mated in May. Over the past few weeks, they've been gradually separated again to imitate the natural process. And Shera will probably keep the cubs to herself for awhile; keepers say the cubs will not be out in the yard until late fall. Ultimately, keepers will introduce the cubs to their aunt Nababiep, in keeping with their goal of building a pride. Nababiep was the mom of a single male cub born in May. In fact, these new cubs wouldn't have just been cousins; they would have been half-siblings, too, via father Luke. But a straw seed lodged in the cub's lung, and he subsequently died of pneumonia. "After the sad loss of our other female lion's cub in May, these cubs symbolize hope for the Zoo and for conservation programs," said Dennis Kelly, director of the zoo. The zoo has explored other bedding options since then. "The use of bedding is imperative as it protects the cubs from trauma during the first fragile weeks of their lives," said Rebecca Stites, a lion and tiger keeper. "We've provided Shera and her cubs with shavings and soft hay with as few seeds as possible." And there might be still more cubs on the horizon. Keepers suspect that Nababiep is pregnant again; they'll monitor her behavior in the coming weeks.